Astronomers using the Atacama Large Millimeter/submillimeter Array (ALMA) surveyed dozens of young stars—some Sun-like and others approximately double that size—and discovered that the larger variety have surprisingly rich reservoirs of carbon monoxide gas in their debris disks. In contrast, the lower-mass, Sun-like stars have debris disks that are virtually gas-free. This finding runs counter to astronomers' expectations, which hold that stronger radiation from larger stars should strip away gas from their debris disks faster than the comparatively mild radiation from smaller stars. It may also offer new insights into the timeline for giant planet formation around young stars. The astronomers narrowed their search to stars between five and ten million years old—old enough to host full-fledged planetary systems and debris disks—and used ALMA to examine the millimeter-wavelength "glow" from the carbon monoxide in the stars' debris disks. "We're not sure whether these stars are holding onto reservoirs of gas much longer than expected, or whether there's a sort of 'last gasp' of second-generation gas produced by collisions of comets or evaporation from the icy mantles of dust grains," said Meredith Hughes, an astronomer at Wesleyan University and coauthor of the study. The existence of this gas may have important implications for planet formation, says Hughes. Carbon monoxide is a major constituent of the atmospheres of giant planets. Its presence in debris disks could mean that other gases, including hydrogen, are present, but perhaps in much lower concentrations. 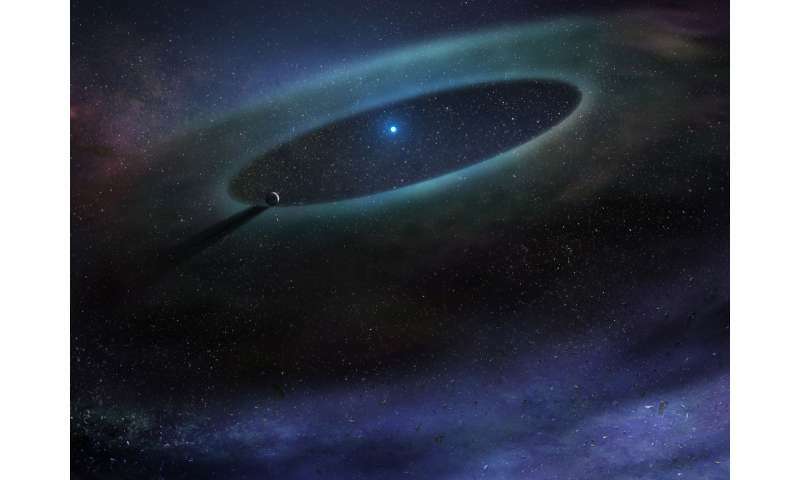 If certain debris disks are able to hold onto appreciable amounts of gas, it might push back astronomers' expected deadline for giant planet formation around young stars, the astronomers speculate. Its presence in debris disks could mean that other gases, including hydrogen, are present, but perhaps in much lower concentrations. Perplexed merger maniacs still grasping at fleeting hope of understanding. NO, perhaps the other gases are indeed at higher concentrations commensurate with the unexpected concentration of the one gas measured. That would be more logical. But no, merger maniacs holding on for fear of even more confusion. So they offer up hope. The greater mass stars are producing more new gas therein, and ejecting more gas thereout, causing unexpected concentrations therefrom. Another contrary observation fitting LaViolette's model perfectly. How many such contrary observations does it take to cause a merger maniac to rethink? So far there are many dozens I have pointed out over the last almost six years. Still I fear hundreds will be necessary. Merger maniacs are an illogical ignorant bunch, unable to think clearly. All the "contrary observations" that you have "pointed out" arise solely from your lack of understanding of physics. They are not "contrary" in the real world. Your so called merger maniacs are people that actually DO understand physics, so you would be well advised to try and learn from them. All the "contrary observations" that you have "pointed out" arise solely from your lack of understanding of physics. They are not "contrary" in the real world. ... so you would be well advised to try and learn from them. Ah yes, the science police strike again. Three cheers for the science police! Convinced they have the ultimate method all figured out, gives them the self-confidence that they otherwise lack in their own inability to think clearly and follow the inherent logic of nature. So, they cling to the science method notion that only irrationally rationale methods and conclusions can keep them safe from straying into otherwise logical conclusions. For if one of their own logical conclusions violates established conclusions of their peers, they will suffer permanent rebuke from the science inquisition. To the rack with them! Physics is failing the public. It is self-serving in cosmology, and not serving greater understanding, clearly. Yet more extraordinary and **unsupported** claims from somebody either unwilling or unable to demonstrate any understanding of the ideas they criticize. Engineers need to knock it off designing instrumentation that actually measures stuff that deeply bites into the cherished claims of DM Enthusiasts like RNP & Schneibo who has pics of BHs & TorL who has pics of DM, neither one of whom will share those pics with anyone here, I guessnow we know why. How about you RNP, you got pics you'd like to share? These new MEASUREMENTS of visible matter we didn't know existed are at the level of pics in case you haven't figured it out. ALMA is the only instrument capable of making these kind of high-resolution images. What on earth are you talking about! Pictures of dark matter indeed! What we have is thousands of scientific observations that need explanation. The fact that you do not understand how to interpret these observations, which arises from your refusal to learn the appropriate physics, renders your claims worthless. Also, the new observations that you harp on about are of such a tiny amounts of matter that they are totally insignificant in relation to the amount of dark matter that observations suggest is present, so that is another specious argument. It's pretty clear nobody in the astrophysics community has a clue what is going on...their supporters even less. And their uneducated detractors even less still. Googling for "merger maniacs" & tuxford I find 171 results. Repetition and mockery is the only way to penetrate the dementia of committed merger maniacs like yourself. Too bad. Don't you have something better to do in life than act as the resident science policeman. Why not try to gain real understanding about the nature of nature itself, rather than simply sticking up for the science community. Maniacs defending maniacs. Sad, really. Let's see if we can do this in a scientific manner: "tiny amounts of matter" versus ZERO AMOUNTS of DM. Therefore: "all three gas-rich disks surrounded stars about twice as massive as the Sun". Hey, RNP, go back & reread the article, it didn't state that the amounts were "tiny", that is your totally fictional synopsis. In the meantime we're still waiting for the first particle of your Cosmic Fairy Dust to show up & with increasingly better instrumentation the gap is becoming immensely wider to bridge. Technology is just such a pesky irritant isn't it RNP? that observations suggest is present, so that is another specious argument. You're just all confused about "observations". We've just had a hugely significant observation eroding a 1930's theory, but THAT was never "specious" to you? "ALMA unexpectedly does not find trove of DM around larger stars"
Repetition and mockery is the only way to penetrate the dementia of committed merger maniacs like yourself. In fact these are the only ways that work for YOU simply because you have never been able to win one of these arguments using actual science. Good grief, talk about the pot calling the kettle black! You have consistently REFUSED to try and gain any understanding of the actual physics you are criticizing. Yes, sorry. To appreciate that the quantities are small relative to DM you would need to actually understand the subject. It is obvious if you do, but it slipped my mind when writing that some of you do not. Sorry about that, but as a consequence ALL of your other statements are specious. Yeah, thank God us simple folk aren't wasting a shitload of time and money chasing a mathematical construct as though it existed...and looking like complete idiots with every failure. As opposed to those educated into moronhood. You seem to fail to realize that we see the DM effect in nearly EVERY spectroscopic observation we make of galaxies and galaxy clusters. So where do you get the idea that these observations are failures? Just because we do not yet know exactly what is causing the effect does not alter the fact that it is real. Nice to hear you now actually CONDEMNING education. It really does clarify you position. As usual, lots of claims, no substance, no understanding of what the people arguing with you are saying. NOBODY is claiming that you can not have mass without energy. Where did you get that idea from? Sorry, that should have read that "NOBODY is claiming that you CAN have mass without energy"
You are AGAIN showing your ignorance of this subject. Just because it is not "detectable in the EM spectrum [sic]" does NOT necessarily mean it has no mass. Where did you get THAT idea? How about that for a comparison? Of course you don't like it because you know so little about SCIENCE. You would need to actually understand the subject of Nuclear Physics to imagine you can make a comparison of something known to exist to something that has so far been PROVEN not to exist, believing otherwise is better known as "specious". In my profession of Nuclear/Electrical Engineering we go into riproaring fits of laughter when we read jargon like what you put up & label as SCIENCE or the SCIENTIFIC METHOD. but it slipped my mind when writing that some of you do not. Sorry about that, but as a consequence ALL of your other statements are specious. ......for sure the entire scientific method of OBSERVATION & MEASUREMENTS have totally "slipped" your "mind", but that's how ALMA found two Suns of VM instead of DM. ....I believe you call it the mass energy equivalence principle? Everything we can detect exists in the EM spectrum, either emitting photons via EM interaction or BB radiation, no exceptions. WRONG. The "mass energy equivalence principle" has nothing to do with it, and I have already pointed out the neutrino which, in detectors, only interacts by the weak nuclear force. We detect the neutrino by the products of these interactions. You REALLY must try to learn the physics that you are trying to disagree with. Anybody who has to call on LaViolette's crankery is in serious trouble from the get go. Lol. Could be a run off between him and Thornhill for crank of the decade. Is he still doing that Sphincter Stargate nonsense? Sorry, no comment. Unintelligible nonsense as usual. ".....and never in the history of humans conducting scientific experiments has there been a theory as completely rediculous [sic] as matter that is not composed of EM energy." I will now rest my case. ........I know, reality is hard for aficionados of Astrophysics to accept. It's been more than 80 years since zany Zwicky started these faith based DM & Tired Light movements, but these days we have the scientific instrumentation to prove he was always wrong but you nuanced followers of this godfather can't recover the staggering losses you're faith has come up against. Have you ever looked in a mirror & wondered what the remaining 80-95% of you must look like? ............this is just priceless. So where is your DM "substance"? Zwicky said in the 1930's we'd find it in envelopes surrounding Spiral Galaxies providing counter gravitational forces which prevent the Radial Arms from imploding to the Central Bulge of the galaxies. Of course, poor Zwicky, how could he know we'd someday have spectroscopy instrumentation that would relegate his zany ideas to the ashbins of history. Zwicky was hated because he would go to seminars of others & get up in the middle of a roomful of listeners & start ranting invectives at the speaker. At times he would even push his way to the lectern & almost push aside the lecturer who was disagreeing with some of his zany ideas about Tired Light & DM. So, to make a long story short this is how he came to be the most hated person in the Physics & Astrophysics culture of his time. Einstein cautioned Zwicky on many occasions to be careful about pushing Tired Light because it was in total violation of Special Relativity & that his DM Theory was likewise a violation of General Relativity. Zwicky did his best to prove Einstein wrong, so is it any wonder he to this day has such a sullied reputation? Einstein was himself long-time supporter of Steady state Universe model, for which the tired light is the only viable hypothesis. If he wouldn't believe Zwicky, he would never adjust cosmological constant to Steady state Universe model, so I'd like to see the evidence of your claim. .............look up the dates for the timeline. It was in the 1920's Einstein added the CC into GR due to his association with E Hubble, this was long before Zwicky showed up with his Tired Light & DM which was in the 30's. I think Einstein had thought about including CC in GR but pulled it just before publishing it, and that was the context of his comment on his "greatest mistake" (been awhile since I looked in Einstein's biography, so I'm not certain of the exact details about this came about). Speed (velocity) was never the issue. Changing wavelength over distance was the issue. Simply put, he initially believed photons would lose energy based on the distance traveled whether there were interactions with other mass or not. The scattering doesn't violate the special relativity in any way. IMO you're just confused and fabricating nonsenses here, being a blind opponent of dark matter. For sure it can be said I am "blind" to DM, and so are you. None of us has ever seen any. [Simply put, he initially believed photons would lose energy based on the distance traveled whether there were interactions with other mass or not. LaViolette's model includes this energy loss, but based on the type of space being traveled through. In very empty intergalactic space photons loose energy, shifting red. In higher density intra-galactic space photons gain energy. The extreme case is inside the dense cores of stars, where the gains are extreme, producing the new energy resulting in hot Jupiters to Quasars. And photons also loose energy climbing out of gravity wells, such as from quasars, making them appear quite distant. This is the model. 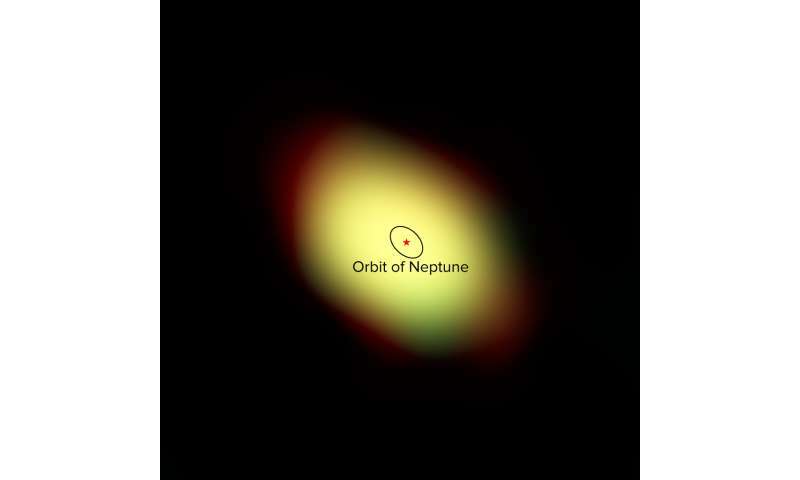 The blue shift was predicted by LaViolette in the 80's and later observed by NASA in the Pioneer anomoly AND in numerous Earth interplanetary flybys. How do photons lose energy if there is nothing for them to interact with? There needs to be a Compton Scattering with an Electron Recoil in turn creating a Photon Frequency Shift to a longer wavelength. How does this happen in "empty intergalactic space"? For that, you will have to become immersed in the model, which contends that space is not actually empty. This is a big hurdle for anyone to overcome, since space appears empty. Sub-atomic particles are not particles, but are propagating reactions between various underlying elementals much smaller than anything detectable. It is the relative local concentration of these diffusive elementals that produces the conditions for the loss/gain in energy and in the spontaneous new reaction that then becomes a 'particle', and that produces the various forces and fields of nature. In followup to my above comment, the only way way I see how energy loss occurs without a Compton Scattering is by the expansion of space itself, but I never read anywhere in Zwicky's Tired Light Theory that he considered this in his theory. Is this what you were referring to when " empty intergalactic space photons lose energy"? I see we crossed posts. I'll look at your last post for a bit, but I'm awfully tired right now & am headed for bed & signing off for the night.